The Nexus Smart 7P Water Ionizer is One of the Best Water Ionizers There Is! Make no mistake, and don't let the low price fool you! Just watch the video demonstrations of the Smart 7p, below, to see how powerful and awesome this water ionizer is! The Nexus Smart 7P water ionizer has medical-grade-levels of molecular hydrogen; continuous-cleaning; and all the latest electronics. I have not found a water ionizer better than the Smart 7P or Smart 9P for the production of the highest molecular hydrogen contents possible for any water ionizer or hydrogen machine. The Smart 7P is a fantastic water ionizer. The quality is outstanding and the price is right. If you look at the price comparison chart, above, you can calculate the cost of your water (over 10 years) to about 10 cents a quart. The Nexus Smart 7P produces high-quality ionized water or filtered water on demand and is easy to use. Alkaline Water Plus has done extensive testing of sll water ionizers and the comparative results of Nexus Smart water ionizers are excellent. What we always thought was impressive was the ORP (oxidation reduction potential) at drinking levels, but now what's even more impressive is the molecular hydrogen concentration, which medical researchers consider the single most important feature to look at. Nexus Water Ionizers are Certified Medical Instruments and Used in Korean and Japanese Hospitals. 100% of the water ionization chamber and plates are made in Japan. The machine itself is made in Korea. The Korean factory is a trusted, state-of-the-art, manufacturer, you can expect the best and get the best from this outstanding water ionizer. Read more about the Nexus manufacturer. The Nexus Smart 7P water ionizer has 7 the most advanced platinum coated titanium electrodes in the world. When a cross section of an electrode is examined at 700 times magnification you can see that the electrodes are now electroplated with a distinct points and valleys. See this plate comparison. This greatly increases the surface area without having to increase the size. This is one of the improvements done to ensure optimal pH and ORP (Oxygen Reduction Potential) levels. The Nexus Smart 7P uses advanced SMPS to ensure you have the most efficient electrical source. In general, pH range of the Nexus Smart 7P is 3.0 to 11.0, depending on source water. Compact Size: The size of the Nexus Smart 7P is perfect. Every Nexus 7 plate water ionizer is tested at the factory for quality control purposes. Then plugs are placed on the water input/output ports in order to retain moisture inside the water cell. This is necessary in order to ensure the seals are kept moist and functional. These plugs must be carefully removed as part of the installation process. 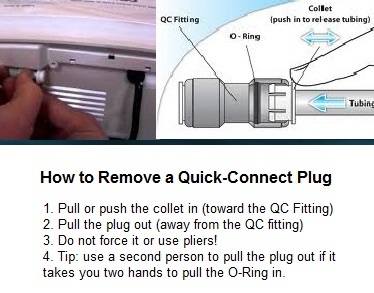 If you are not familiar with quick-connect fittings, please refer to this article which shows how to safely remove those plugs. (Also, see picture, below. )When you remove the red, acidic-water plug it is expected that several drops of water will come out. The Smart 7P Water Ionizer is Now Upgraded to Produce the Highest Levels of Molecular Hydrogen Possible! The New 7 Plate Nexus Countertop Water Ionizer Has A Fantastic Warranty! The Nexus Smart 7P comes with the exclusive Nexus 5-Year Parts/Labor and Lifetime Upgrade-Credits Warranty! A full statement of this warranty coverage can be found at the bottom of this page: https://www.alkalinewaterplus.com/water-ionizers-filters/nexus-water-ionizers-filters/. You are automatically registered for this warranty when you purchase your Nexus water ionizer through Alkaline Water Plus.